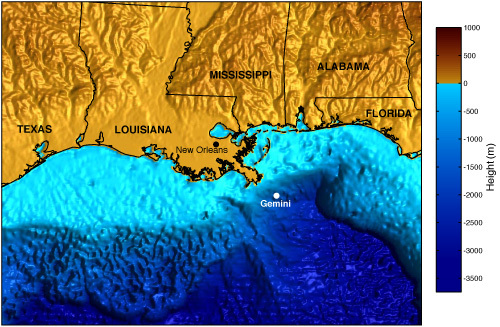 Gemini Prospect is located in the deepwater Gulf of Mexico about 100 km southeast of New Orleans. The bumpy seafloor bathymetry in the northern Gulf of Mexico is due to deformation from underlying salt sheets and intrusions that are often a few kilometers or more thick. The salt was deposited in the late Jurassic as shallow seas associated with the break-up of the Gulf of Mexico dried up. Later deposition of organic material from the Mississippi river covered the salt with several kilometers of sediments. The overburden caused increasing pressure and temperature on the organic material, transforming it into hydrocarbons. Salt has a relatively low viscosity and density compared with the brittle overlying sediments and flows upward and laterally, deforming the sedimentary layers in processes collectively known as salt tectonics. Sometimes the deformations form structures which trap hydrocarbons. Petroleum exploration companies target these structures. 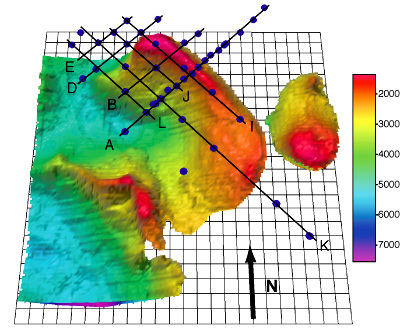 An industry 3D seismic reflection survey at Gemini Prospect revealed the complex 3D shape of the Gemini salt structure, shown above as the colored surface. Depths are in meters. While the seismic method is good at detecting structural boundaries such as sedimentary layers and the top of salt surface, steeply dipping salt and the deeper bottom of salt is often harder to detect. In order to provide better constraints on the base of salt depths, we developed the broadband marine magnetotelluric (MT) method for investigating the electrical conductivity structure of salt structures. In 1997, 1998, 2001 and 2003 we collect 42 sites of broadband marine magnetotelluric data in the period band of 1-3000 s at Gemini, shown as blue circles. An example of the MT apparent resistivity and phase data from Gemini Prospect is shown above. Red symbols are for the impedance component with the electric field oriented to the south-east and green symbols are for the electric field oriented to the north-east. MT is typically used to detect conductive structures, however, in our case we are using it to detect the resistive salt (around 100 ohm-m) that is surrounded by conductive sediments (about 0.5 ohm-m). When a resistive structure is about 10 times or more resistive than the surrounding rocks, electrical currents flow around it and the MT response saturates. This is seen in the small signature of the resistive salt in the MT response at periods around 10 s.
The MT data from the lines shown in the map figure where inverted using the OCCAM2DMT inversion routine. Above we show inversion models obtained from Line A's data (left). 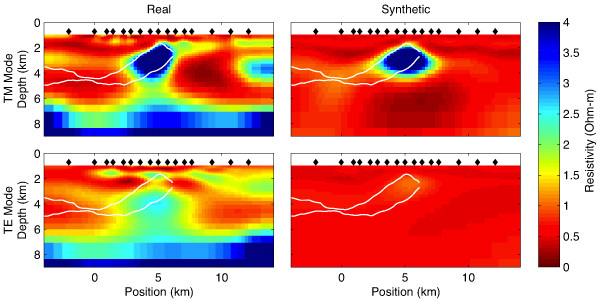 In order to study the potential 3D effects in present in our 2D modeling, we performed a synthetic inversion of the 3D MT response of the seismic salt structure (right). The top row shows the results for the TM mode (electric field oriented along the direction of line A, an azimuth of about 45 degrees) and the bottom row shows the TE mode (electric field oriented perpendicular to the line of sites) inversion. Black diamonds show the location of the MT sites and the white lines show the seismic salt profile. Both the real data and synthetic inversion show better agreement with the seismics for the TM mode data. The resistive blue feature correlates well with the seismic salt where it is less than about 4-5 km deep. Deep and thin salt does not contribute enough to the MT response to be detectable. Note that line A is the most amenable to 2D modeling as it cuts across the middle of the salt ridge. 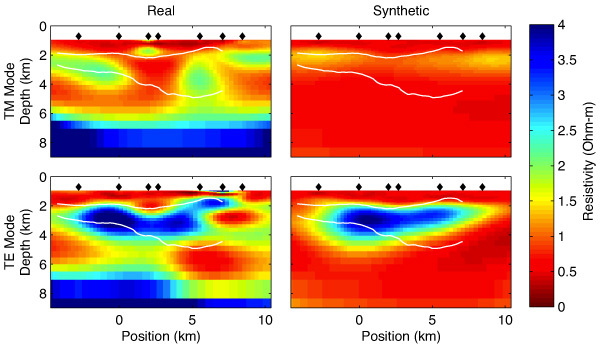 The inversion of Line I's data showed an unexpected result--the TE mode (electric field perpendicular to the line direction) gave better agreement with the seismic salt structure. 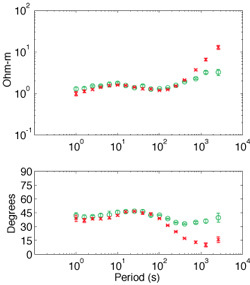 This suggests that 2D inversion for resistive structures works best when inverting the mode with the electric field oriented across the dominant structural strike. This inversions also shows how marine MT can constrain the base of salt depths here and discriminate between deeply rooted and shallow salt. In order to better understand the structure at Gemini we have plotted both the marine MT electrical conductivity (resistivity) model and the seismic reflection data on top of each other. The bright reflections in the seismic profile correlate well with the blue resistive salt structure. Salt at depths of about 4.5 -5 km is too thin to contribute to the electrical data and so is not recovered in the electrical conductivity model. Not the correlation of shallow resistive features with some of the rougher seismic reflections. During the 2003 survey we deep-towed our active-source EM transmitter (SUESI) along Line A. 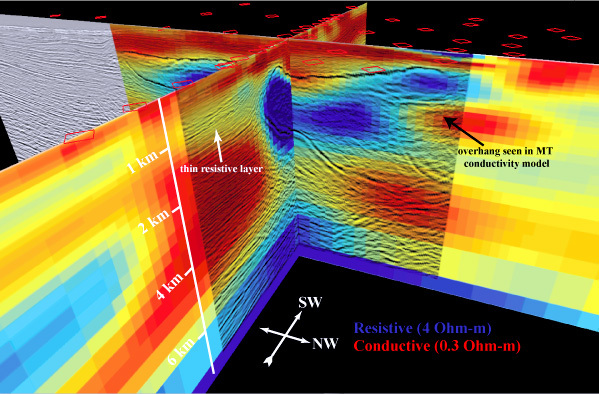 Preliminary analysis of this data requires a thin and shallow conductor at positions of 6 - 10 km, which correlates with the resistive near surface layer shown above. The combined MT and seismic results for Line I. Notice the thin finger of overhanging resistive (blue) salt that correlates well with the top of salt reflection and another shallow reflection beneath. This shows how broadband marine MT can image overhanging and steeply dipping salt structures. A 3D view of the combined MT and seismic results for Line A and Line I. Click here for a free 3D visualization of Gemini Prospect.